Come on, let’s get ready to RUMBLE! … Ok, now let’s waste no time and get straight to the point to help you better understand this Battle. Serverless is the new hot trend in the tech world as far as cloud computing is concerned, but what are the merits and demerits of this new backend development approach? Is it something that came to stay? Is it something that sounds more like a marketing appeal? 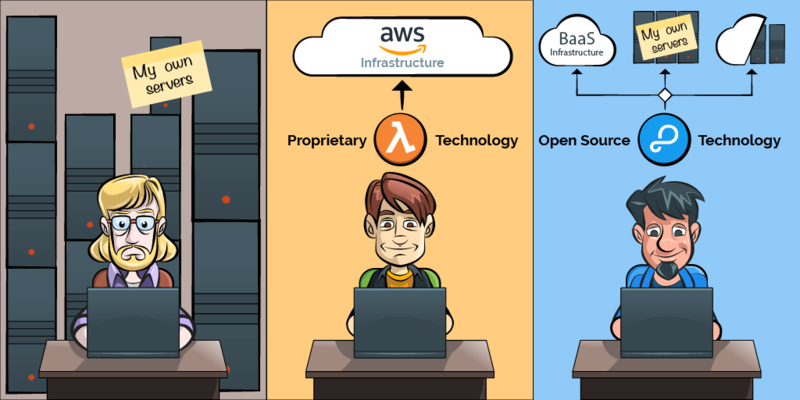 Here, in this article, I’m gonna try to come up with an analysis of serverless considering two different platform implementations (approaches): AWS Lambda and Parse Server Cloud Code (open source). Ok, let’s start analyzing the benefits of the serverless approach. But what is Serverless? As the name suggests, is it a kind of Server abstraction? That’s right. With this, you can code your functions without worrying about any infrastructure hassles, such as setup, deploy, scaling, maintenance, etc. Using serverless platforms, you can code and run your function as quick as you finish it. Think of them as a natural evolution or extension to Microservices where each function is understood as a microservice. A single chunk of code or ‘function’ is executed any time a distinct event occurs. The function ‘wakes up’ takes some amount of time to execute and consume the server’s resources, including memory before getting vanished after completing the task. Here’s the best part: NO persistence, NO dedicated machinery. In fact, you have no idea where your code is running at any given time. All you need to do is give the command to run your code and the platforms will give you the answer, along with the bill of course. It’s fast and beautiful, isn’t it? AWS Lambda is the most popular and advanced implementation of the serverless architecture. It’s like a new bet of Amazon to increase retention and revenue using their servers. Using Lambda, you can write a function in your preferred language (NodeJS, C#, Java, Python) and run it anytime. It is a very attractive tool as it allows you to interact with your Elastic Compute Cloud (EC2) (if your infrastructure is already on AWS), and Simple Storage Service (S3) with a bunch of resources that AWS make it available to you. You can start coding on Lambda console and run your code in few clicks (you can also use the Serverless framework and deploy your functions using the Lambda CLI). In addition to all events that can come from client side to trigger your functions, you also have a bunch of AWS cloud events like a file upload or even a new instance on EC2. You can also create a test event to test your function and check if everything is running as required. As far as pricing is concerned, AWS Lambda allows you to pay only for what you use. To be precise, you’ll be charged on the basis of two parameters: The number of concurrent executions and the time taken to execute your code. The charges will be based on the amount of memory you require to run your lambda function. Always remember, the more memory you use to run your function, the more you need to pay (per each 100ms running the function). This approach is very fair; if you are a professional and code a function that performs great (considering the complexity and memory usage), then you have to pay less. On the other hand, if you’re a newbie and write the code that doesn’t perform that well, then you have to reinvest, which will cost you a lot more. Here are some discussions on whether the lambda has a fair pricing or not. One of the major downsides of Lambda is that it is not for beginners. The pricing can be prohibitive and if you are not smart enough to set up the locks to make the billing predictable and/or if you do not make your code run in the best way (that can take a lot of time), you can be surprised with a massive bill. Another downside when using lambda is regarding the optimization of your functions. You might be the smartest programmer in the world, but your efforts will be limited by the AWS lambda Application tier when it comes to running your functions. In other words, your optimization is constrained by Amazon. This could be very dangerous; if you have a very important function running on AWS and you need to switch to your own servers or other clouds in order to optimize its performance, you will be a little troubled. So, the AWS lock-in (‘Lambda and serverless are one of the worst forms of proprietary lock-in we’ve ever seen in the history of humanity’) is the main downside of Lambda today. If Amazon can solve that it would be awesome to the developer’s community. Parse Server is an open source framework written in NodeJS that helps developers create and manage their backend easily using a powerful dashboard, i.e. the Parse Dashboard. It also allows you to write your own functions using the Cloud Code. Basically, Cloud code are functions coded in NodeJS that run over the Parse Framework and give you the flexibility when using a Backend-as-a-Service (BaaS) solution. Even though Parse is just a framework, we can’t assume that this solution is Serverless, right? So, here’s where Back4App service comes in handy. Back4App is a Parse Hosting platform that allows the developers create, deploy, and scale their backend using a complete serverless approach. Using Back4App, you can build your Cloud functions on your computer and upload them using a very easy-going CLI. It is very simple: you just have to install the CLI and edit the files of your backend in a text editor of your choice. Here you will find the complete process. For small tests and projects, you can upload it manually and run just by calling the back4App API. Using Parse Server Cloud Code, you can access all your backend resources, send emails, call Cron Jobs, send push messages, and more. Also, you can use cloud code to integrate with third-party APIs, which is really amazing. The main advantage here is that the API is built in real time as soon as you publish your cloud function. In AWS, you will need to use Lambda + API Gateway. Regarding triggers, you can call your cloud code using events on the Database like Before/After – insert/update/delete. The pricing is based on API calls consumption and is a pre-paid model (you won’t have surprises). So your function can run both in 100ms and 10s without paying any additional charges. The platform also provides you a free limit to use per month while developing your function and in a small use: 10.000 requests per month. So, you don’t need to invest your time writing the perfect code if you are worried about your bill. The main point of this stack is that you have an open source solution. You can use the serverless concept to write, deploy, and scale your functions. If necessary, you can optimize your cloud code function at any time by writing a more performant code. And if you need you can also access the application layer to change the architecture of your function. In other words, you can change the application layer to best use the server’s resources in order to get the best performance. If necessary, you can also change the servers (processor/memory) that you are using to process your specific function. This may sound a bit contradictory with the serverless concept, but it is an approach that allows you to have swift serverless speed while developing and deploying your functions, and get all the flexibility you need when scaling. Ok, now let’s compare the two services. While Lambda is a complete platform with a lot of resources, including multiple coding languages, automated tests, user-friendly CLIs, internal AWS structure triggers, AWS API gateway, etc., Parse Cloud code is a simple platform. Regardless of its simplicity, Parse platform has its own advantages. BaaS integrated cloud functions directly interact with your database directly and give you more options to code business rules. On AWS to work with a database using Lambda you will have to make all the CRUD and the triggers by yourself. On both platforms, you can code integrations with external services (like 3rd party APIs), you can also access services like sending emails, push messages, social logins, etc. The main advantage of using Lambda is that it is user-friendly when it comes to coding functions. Also, Amazon ensures that you get the best experience while running functions. As far as pricing is concerned, the Parse Open source platform is a bit more “controllable” because you are provided with numerous prepaid plans, and most importantly, you pay per request, not per the resource consumption. You can end up with a surprising bill when using the AWS platform. Regarding performance and optimization, you will get an excellent output when running your lambda functions or your Cloud Code functions. The point here is that how free are you to optimize your functions changing all the structure that runs your function. On Lambda, you can optimize your code, but if you need to change anything related to servers, you can’t do that. Parse Cloud Code: as it is open source, you can change the way each request is processed. In other words, you can customize the application layer as well as the server layer to enhance your performance. This can be a bit contradictory with the serverless architecture. Ideally, there can be no platform that provides you the necessary speed and flexibility to optimize large applications. 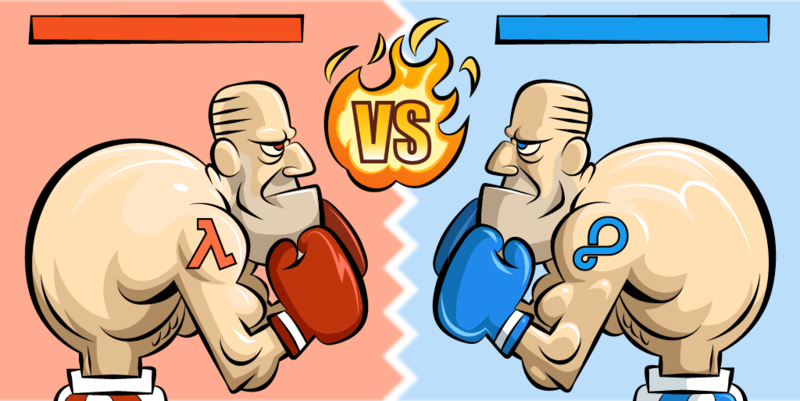 Regarding optimization and pricing, Parse Cloud Code outshines AWS Lambda by a hefty margin. The reason being that Lambda functions can cost you thousands of dollars in the long run if you don’t optimize and estimate its cost initially. Even though the concept of pricing is pretty much straight-forward, it’s deceivingly cheap at low volume. With the current AWS mechanisms, calculating, monitoring, and optimizing lambda cost can be extremely time-consuming, which is one of the biggest downsides of AWS. On the other hand, the cost structure of Parse Cloud Code is a bit more controllable, and the best part is that it allows you to pay per request, not per the resource consumption. Isn’t that worth paying for? Of course, it is! When it comes to features and other additional benefits, AWS Lambda is well ahead of its fellow rival Parse Cloud Code. If you aim to scale your product regularly without focusing on the backend, then AWS Lambda is probably the best choice to make. It empowers the use of serverless as well as microservices programming architectures to support Function-as-a-Service (FaaS), which allows developers to focus primarily on writing code. Some of the key features of AWS Lambda include Simple Development & Deployment, Automatic Scaling & Fault tolerance, Cost Efficiency, etc. Apart from these, AWS recently announced a couple of new features to help broaden its customer base, which includes Environment Variables and an Updated Serverless Application Model. Furthermore, AWS also improved the ability to build serverless applications in AWS Mobile hub and is presently focusing on adding an X-ray function which would assist in debugging. In contrast, countless features are missing in Parse Cloud Code such as Simple Provisioning / Deployment, Dashboard, Analytics, Email Sign Up, Twitter Sign Up, Global Config, Push Notifications, In-App Purchase Receipt Validation, System Emails, Background Jobs, Webhooks, etc. As far as performance is concerned, both the platforms are neck to neck, which means it’s a draw. This means you will get excellent results while running any of these functions, i.e. either Lambda or Cloud Code functions. Did you like this post? Sign Up Back4App for FREE. I’m a computer engineer passionate about Startups. Thank you for your feedback. It is only possible to comment the post right now. As far as performance is concerned,both the platforms are neck to neck, which means it’s a draw.This means you will get excellent results while running any of these functions,i.e. either Lambda or Cloud Code functions.